In January 2006, the Worlds Champion Batista was forced to relinquish the title due to an injury he sustained at the hands of The Worlds Strongest Man Mark Henry during his and Rey Mysterios match-up against MNM in a Steel Cage. As a result, a battle royal was held to determine the new champion however, to everyones surprise, the last participant was the then Raw Superstar Kurt Angle. General Manager Teddy Long allowed the Olympic Gold Medalist to compete and after lastly eliminating Mark Henry, Kurt Angle became World Heavyweight Champion. At the Royal Rumble 2006, Kurt Angle once again defeated Mark Henry by a roll-up and thus regaining the World Championship. However, his celebrations were cut short as on that night marked the return of the phenom himself The Undertaker on a horse and cart, who had his eyes set on the gold that Kurt Angle was in possession of. As these two behemoths has their eyes locked on each other, the hands of the dead man were raised and a series of lightning bolts struck the ring causing it to collapse. The challenge had been issued, the champion had accepted and the stage was set for one of the greatest matches of all time to take place at No Way Out 2006. The Undertaker vs. Angle wrestled a hard-fought match which nicely mixed Taker’s brawling with Angle’s technical wrestling and was honestly entertaining. Taker seemed to have Angle finished and we were getting ready to see a new champion, but soon Kurt pulls an intelligent swerve as he used his brother Eric Angle (making his debut) to pose as Kurt while Kurt rolled Taker up from behind and held the tights to score the pinfall. I really enjoyed this match because not only was it a fun brawling/technical wrestling match, it was also a launching point Kurt Angle during the Attitude Era. Angle and Taker had another classic title match for the World Heavyweight Championship at No Way Out 2006. I advise all of the BTR fans to check out both of those matches on the WWE Network. This is the feud is where the Undertaker first dubbed the ring “his yard”. Angle, the champion, enters first; I hate that. One year after his debut at last year’s Survivor Series, Kurt’s the champion. 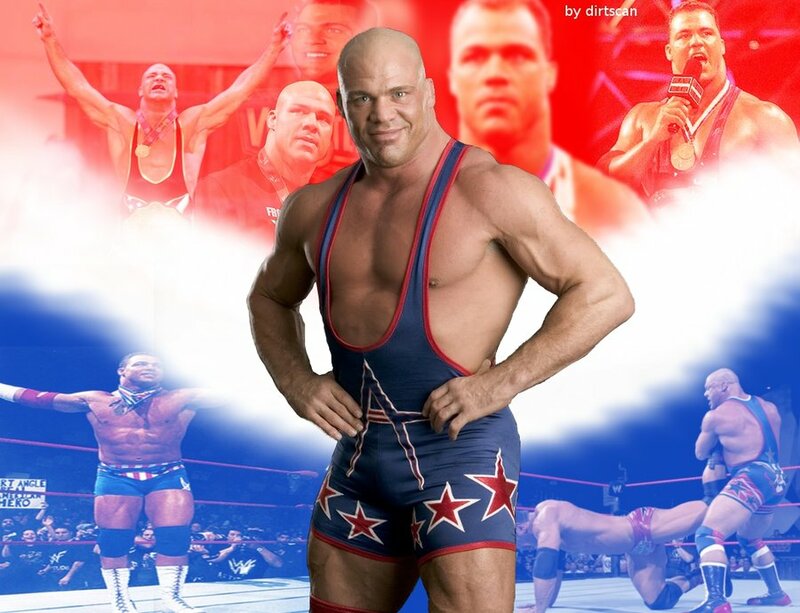 Pre-match, Kurt asks the fans to reflect on their favorite Kurt Angle moment. He says that he was going to have the Floridians vote for their favorite moment, but that sets up the second shot of the night on Florida’s inability to count votes properly; obviously referencing the 2000 United States Presidential Election debacle. Taker is wearing light snakeskin colored pants and it looks good… on Trish Stratus, but not on the “American Badass”. Angle stalls at the bell… forever. Undertaker gets annoyed and gets a chair and tosses it at Angle; Kurt seizes the opportunity and waffles Taker with it. Angle gets a few punches in and stomps in the corner. Angle is winded from “punching himself out”; Taker quickly shrugs off his offense and pummels Kurt in the corner. Taker hits a big boot and leg drop but he PULLS ANGLE UP AT TWO! He continues the onslaught with a bodyslam and elbow drop and pulls Angle up on two again. He shouts Old School and then lands it; Taker looks for the chokeslam but Kurt retreats to the floor. Taker stalks him on the floor and then stomps him as he is trying to reenter. Taker no-sells it and continues to pummel him. Angle catches him in a release German suplex for two; Angle clotheslines Taker to the floor. Angle leaps off the apron but gets caught and posted, twice. He tosses Angle back into the ring and punches, a lot. He misses a running boot in the opposite corner and Kurt works it over and wraps it in the ropes. Taker keeps punching back, Kurt keeps kicking the leg. Angle charges into a Fujiwara armbar which draws Edge and Christian to ringside. They distract the referee as Angle taps; Taker lunges at Christian and gets hung off the top rope. Taker recovers and goozles Kurt, he kicks the leg to take over, and applies a leg grapevine. Edge and Christian remain in Kurt’s corner as he continues to apply pressure on the Undertaker’s leg. Taker kicks himself free and goes out after Edge and Christian and beats them up drawing referee Earl Hebner to the floor to extricate them from ringside. Taker returns to the ring and chokeslams Kurt; Hebner takes a while returning to the ring since Edge and Christian are still detaining him. Hebner counts two; Taker stalks Hebner for not counting three and Angle sneaks in a schoolboy for two. Undertaker clotheslines Angle down to retain the advantage; a side Russian leg sweep gets two again. Kurt rolls to the floor and pulls Taker down by the leg and rams it against the ring apron. Back in the ring, Angle applies a figure-four leglock; Taker struggles but eventually reverses the hold. I don’t know how that really reverses the pressure though; I’ll have to consult Dr. Michio Kaku on that one. Taker recovers and powerslams Angle but Kurt goes back to the leg and slaps on the ringpost figure-four. Taker fights back from his knees and stunguns him off the turnbuckle. Now Taker is giving Kurt more respect in the match; Angle gets a BLATANT low blow, somehow the referee missed it. Angle tries a powerslam but Taker reverses and nearly hits the Tombstone; Angle flips over again and winds up tumbling to the floor. Taker comes out after Angle so he crawls under the ring; Taker pulls him out and tosses him back into the ring. Undertaker hits the Last Ride and gets a one… two… the referee stops counting. The building thinks that Earl sold out again at a Survivor Series (yeah, they still reference it); Taker confronts Hebner about it but he points to his face and then Angle’s. All of a sudden, the real Kurt Angle reappears from under the ring and schoolboys Taker with tights and gets three. The “fake” Kurt was his brother Eric Angle who looks almost identical to Kurt. Hebner realized it mid-count that it wasn’t Kurt. Post-match, the real Kurt Angle runs out of the building and speeds off. The match wasn’t awesome or anything, that’d happen in 2006, but the ending sure proved that Kurt is intelligent. The match was booked to make Kurt appear he was nowhere in the same stratosphere as the Undertaker; at least in the end Taker looked to be giving him a teensy-weensy bit of respect. Unfortunately, this happens to a ton of first time champions in the WWF/E; Chris Benoit, Chris Jericho, The Miz, Sheamus, (yes, even) Randy Orton… better wrestling days would be ahead for Kurt.